Alive and Young: Pope, Looking Green These Days . . . and Not With Envy. 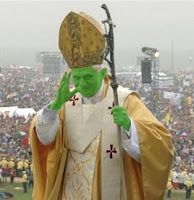 Pope, Looking Green These Days . . . and Not With Envy. Benedict XVI is one of the 'greenest' religious figures in the world. He ranked 6 in a recent article by Grist Magazine. He earned the ranking for having an electric pope mobile, by making Vatican City solar powered, and for encouraging the people of the world to be good stewards of the Earth. I always laugh when people are shocked that the Catholic Church would say something like the environment needs to be taken care of. Haven't people read Genesis 1 where God calls humanity to keep the Earth? You can't be a very good keeper of something if (1.) you allow it do destroy itself (or the keeper for that matter), or (2). you destroy it yourself.